In a survey we conducted at The Ultimate Sports Parent, more than 45% of sports parents and coaches said that their kids become easily frustrated or angry after making mistakes. They know kids struggle to let go of mistakes. As a parent or coach to young athletes, you must attempt to help them better cope with disappointment and setbacks. Kids who can’t handle their frustration are more likely to drop out because they no longer have fun. We receive almost daily questions from sports parents and coaches about how to help their athletes cope with frustration. Due to the demands coaches and parents place on their athletes, this is a huge issue for young athletes today. For example, a sports parent, Gretchen, says that her 10-year-old baseball player gives up after one bad at-bat or one poor game. He simply checks out, she says. But punishing kids for getting upset in practice or competition does not work! Do you make your athletes do laps when they get angry or hit their racquet or bat on the ground? Do you threaten to pull kids out of sports altogether if they can’t control their outbursts, like I have in the past? Punishing kids only causes your athletes to get more upset the next time because they know you will come down on them. It does not help kids with the real issue: What’s going through your athletes heads after they make mistakes or lose. Your athletes don’t learn the skills that help them cope. Frustration begins with your athletes’ expectations. They demand perfection of themselves or expect to win all the time. If you have a hot head, most likely he or she expects to have a perfect game and never strike out or commit a turnover. They may tell themselves they must score 15 points or go 4-for-4 at the plate. The athlete will lose composure, get angry, and often lose confidence. Coach may pull the athlete from the game. Sometimes he or she may even give up and tank the game or match. I’ve personally seen this a lot in baseball and tennis. Thus, punishing kids for their tantrums in sports does not work. First, you have to help them change their ridged beliefs and expectations that cause the frustration trap. Second, you also have to give your athletes strategies they can use in the moments they start to unravel and when they are self-critical. Expectations are the “shoulds” that athletes uphold, usually about outcomes, quality of performance, personal statistics, and how others should treat them. For example, a common expectation is: “I should win easily today.” The “shoulds” set up your athletes for disappointment or frustration if they don’t achieve these personal demands. Once you have identified your athletes’ expectations, they must agree to discard them, which is easier said than done. Why? Your athletes have learned – In some cases for many years – to hold tightly to their expectations about performance, statistics, and outcomes. You’ll want to help your athletes replace their outcome expectations with simple mini-goals or objectives that will lead to greater composure. As a coach or parent, focusing on your athletes’ observable behavior of shutting down or crying is not the best solution. You have to address your athletes’ view or beliefs about their mistakes. When frustrated or angry, athletes’ minds are glued to the past. You want to help your kids focus on the present and not dwell on the past. Your players must learn to move on to the next play, shot, routine, or point. A good place to start is to ask your athletes to write down their anger-causing thoughts soon after practice or the completion of competition. Please allow them to “cool down” first and then ask them to recount what they were thinking right after the mistake. Help them to recall the specific thoughts that lead to frustration or anger. How athletes think about their mistakes is what can cause emotional pain, not the mistake itself. Your athletes will want to replace the anger-causing statements with composure-boosting statements that help them let go of the anger by instilling greater self-acceptance. This is a difficult step for most kids because at this stage their learned behavior is self-criticism. The new statements will soon begin to interrupt the old pattern of anger-causing thoughts and instill a new way of thinking about mistakes. This will create a better emotional reaction. Dr. Patrick Cohn is the author of “The Composed Sports Kid” CD program. 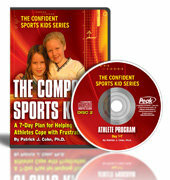 Visit Peaksports.com to learn more about The Composed Sports Kid CD program.